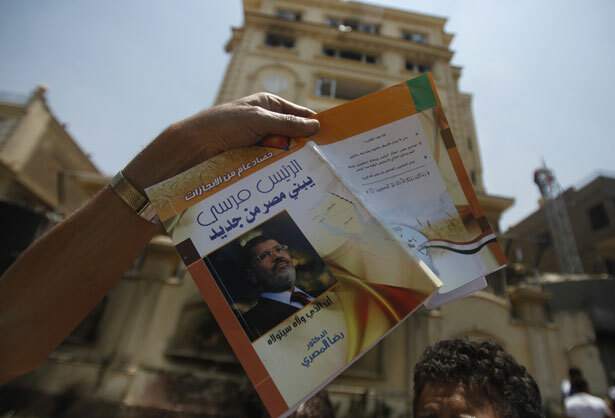 End of Muslim Brotherhood Rule in Egypt? Or Civil War? Egypt is teetering on the brink of becoming Libya. Or Syria. Two years after the revolt that toppled Hosni Mubarak, Egypt is teetering on the edge of an explosion. President Morsi, the Muslim Brotherhood stand-in who was elected president a year ago, has now defied the military’s forty-eight-hour ultimatum that he give in to the demands of protesters, millions of whom have streamed into the streets. Despite growing international pressure, the resignations of most of the non–Muslim Brotherhood ministers of his government—including the foreign minister—and spreading protests, Morsi seems willing to call the army’s bluff. We’ll find out in the next day or so if the army is bluffing. And the Muslim Brotherhood, which has a long history of paramilitary activity, is building its own defense force in preparation for what could become a civil war. As the night wore on, Morsi’s position seemed ever more untenable, with the Ministry of the Interior announcing its “complete solidarity” with Egypt’s armed forces, and the army taking control of local government headquarters in Fayoum, a governorship south of Cairo. President Obama has called Morsi, from Tanzania, to urge him to listen to the protesters. General Martin Dempsey, the chairman of the Joint Chiefs of Staff, has called General Sisi, the Egyptian defense minister and spokesman for the military council—although there’s no word on what Dempsey said. The United Nations’ top human rights official, Navi Pillay, has also urged Morsi to make a deal. But after two days of massive protests against Morsi, [the Salafist Call] endorsed the opposition’s main demand (early presidential elections), and also called for a government of technocrats and a committee for constitutional amendments. ElBaradei will also be mediating between state institutions and all political forces to draw a map for political transition. The coalition that backed Sunday’s protests said there was no question of negotiating now with Morsi on the general’s timetable and it was already formulating positions for discussion directly with the army once the 48 hours are up. Mursi’s military adviser, U.S.-trained former chief-of-staff General Sami Enan, also resigned. “The Egyptian people have spoken and as a result everyone must listen and implement, especially since this unprecedented (protest) was accompanied by the fall of some martyrs which is unacceptable because Egyptian blood is valued highly and must be preserved,” Enan told Al Arabiya television. El-Watan quoted senior General Adel El-Mursi as saying that if there were no agreement among political leaders to hold early presidential elections, the alternative could involve “a return to revolutionary legitimacy”. Under that scenario, the sole functioning chamber of parliament, the Islamist-dominated Shura Council, would be dissolved, the Islamist-tinged constitution enacted under Mursi would be scrapped, and a presidential council would rule by decree until fresh elections could be held under new rules, he was quoted as saying. That is largely the opposition position. Sharif Abdel Kouddous writes about why, one year after Morsi’s election, Egyptians are now demanding his resignation.